Yogyakarta is a relatively small region on the relatively small island of Java. Who knew this little town would be so chock full of wild nights and stunning sights? Not me, that’s for sure. You can ride in a musical car covered in LED that makes you feel like you’re on LSD or sit in complete silence at sunrise in front of a temple. And to think, I almost missed it all because of some bad naan sauce! Yep, the night before I headed out to Yogyakarta, I thoroughly enjoyed one of my most favorite foods ever, naan (love you, naan! ), and then thoroughly puked my guts out all night in Kuala Lumpur. Not cool, naan sauce. Not cool. But, in the end, I make my flight the next morning, and I got to explore all of the fun things to do in Yogyakarta. Hit the temples as the sun comes up and then head off to a ready to erupt volcano! 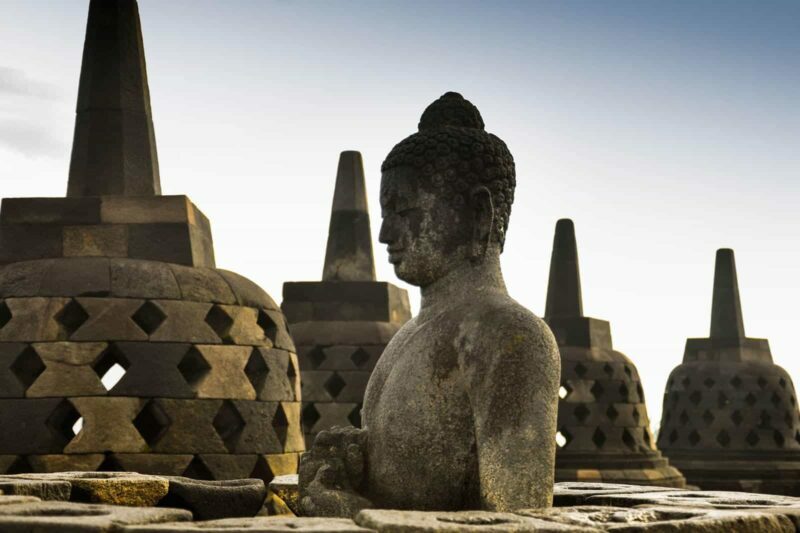 As long as you line your Yogyakarta itinerary with the right tour groups, you can easily do both of these in one day. Just choose a tour below that offers it. 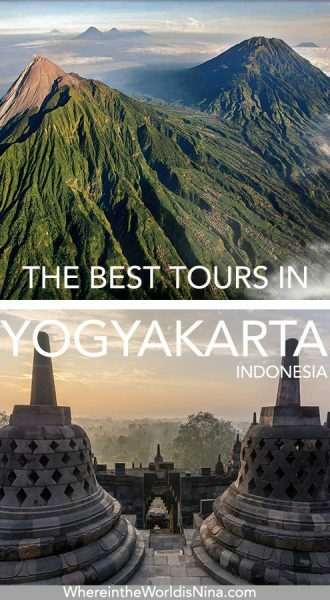 I’ve handed over some choices for you so you can choose the best Yogyakarta tour for you but it may be a bit too much for some to do in both days, so choose wisely! C’mon, you can’t visit a city in Indonesia without checking out some temples. They may not make for crazy cave dropping or hiking, but they’re worth a visit just for the majestic pictures and that warm humble feeling you get when you’re standing on one of the most magnificent architectural structures on earth. Pro tip: Get in early in the morning to avoid crowds. 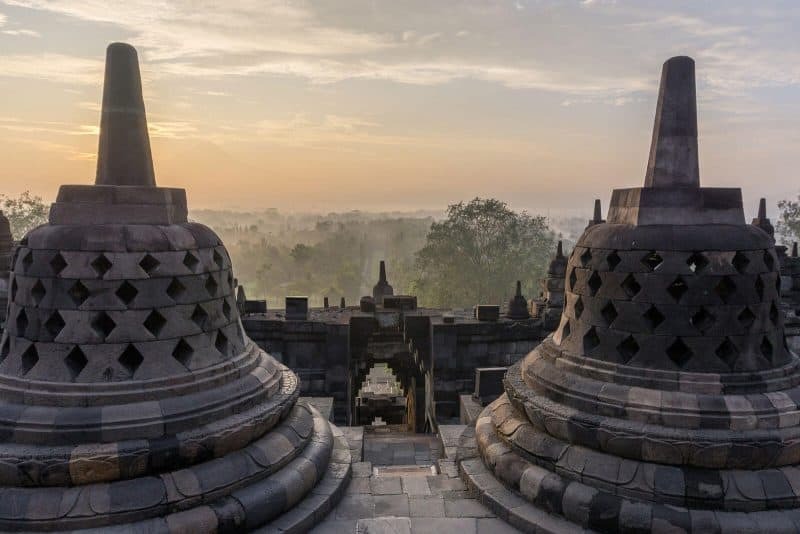 The best way to visit these temples is by making to Borobudur for sunrise. So set your alarm, grab your coffee, and head over. You can even join a Yogyakarta temple tour to make sure everything goes according to plan. 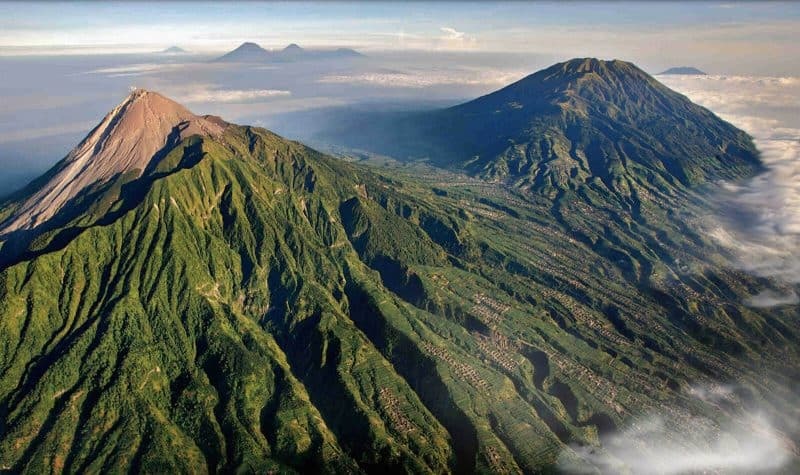 Merapi is the largest active volcano on the island of Java, which means it could erupt at any moment, with you standing right there in your hiking boots. Pretty cool, huh? It’s a must on your Yogyakarta itinerary. Supposedly, this volcano erupts every three years, but whether you tour it right after an eruption or just before (hopefully not too close to before), the surrounding area is fascinating, and the hike is invigorating. You’ll likely see burnt town trees and hardened lava along the trail. 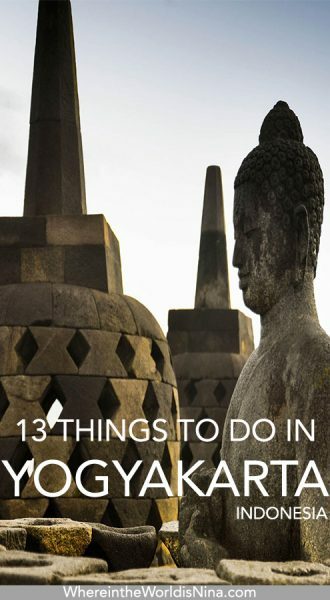 Now for all the little things to do in Yogyakarta. A light up car here, a street market there. Throw in a palace and some wish giving trees, and you’re good to go! One of the odd yet cool things to do in Yogyakarta is to wander through the Water Palace. Guess what: the only water is a pretty pool with plants sitting around it, and it’s not really a palace. At. All. Wow. How not exciting. Right? It’s actually a pretty cool myth/tradition. You take a stroll blindfolded in between these two fenced-in trees and make a wish while you walk. If you make it to the other side, your wish will come true. If you fail, heck, try again. You deserve your wishes! I made it through on the first time. Yes! Clumsy little me. Too bad I forgot what I wished for now. You wanna know what to do in Yogyakarta? This! 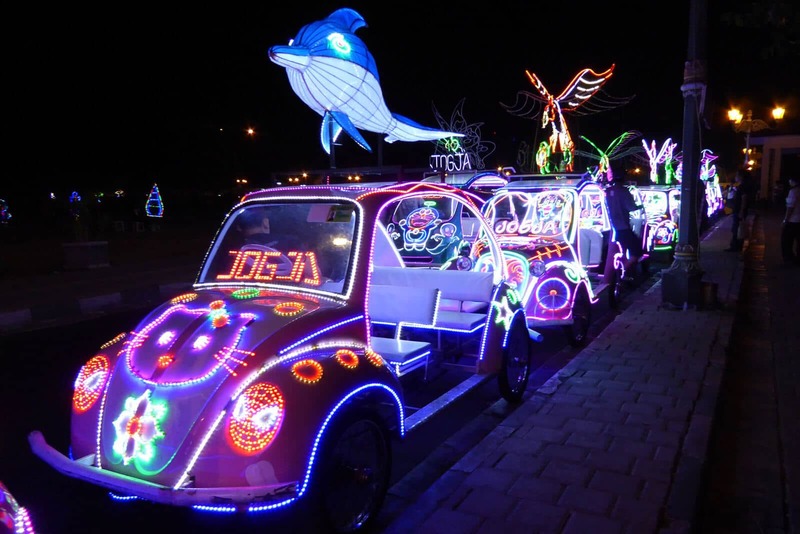 You can pay about $6 to get into a pedal-powered VW Beetle that is lit up all over with LED lights and be driven around the center of town, Alun Alun. These cars also have wireless music blasting from speakers throughout the car, so it’s a loud, obnoxious, bright, wild adventure. It’s one of those weird, random but cool kinda things to do in Yogyakarta. Yes to markets! Malioboro is an iconic shopping district in Yogyakarta. It’s a long, bustling street that absolutely must be on your Yogyakarta itinerary. You can practice your bartering skills over flip-flops and sarongs and then head out to check out a pub for a beer. 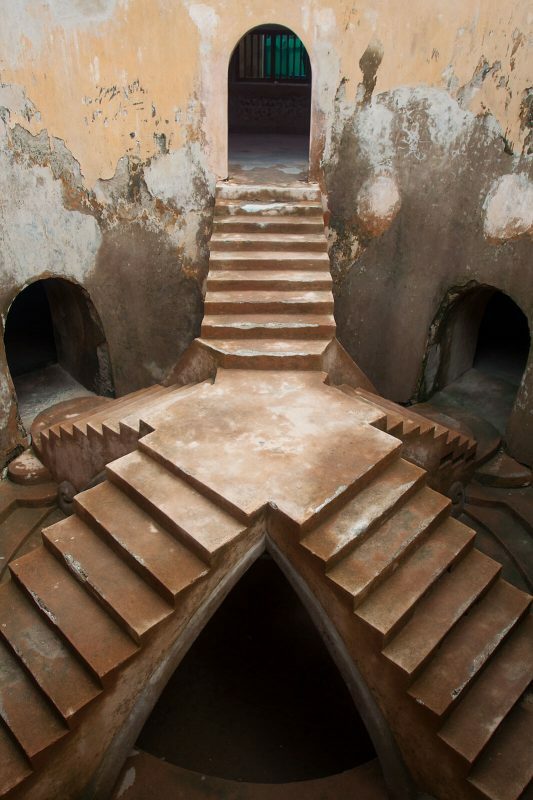 So Yogyakarta is an artist town. Experimental artist from all around come to show off their skills on canvas and concrete walls. You could fill a week-long Yogyakarta itinerary just with hunting down the legal and illegally placed art along walls and buildings in this city. The amount of color, texture, depth, and dimension is something out of this world. Now, if you just can’t manage to tear yourself away after three days, it’s OK! There are so many more things to do in Yogyakarta. I wish I had the time to do these activities when I was there. Spelunking anyone? 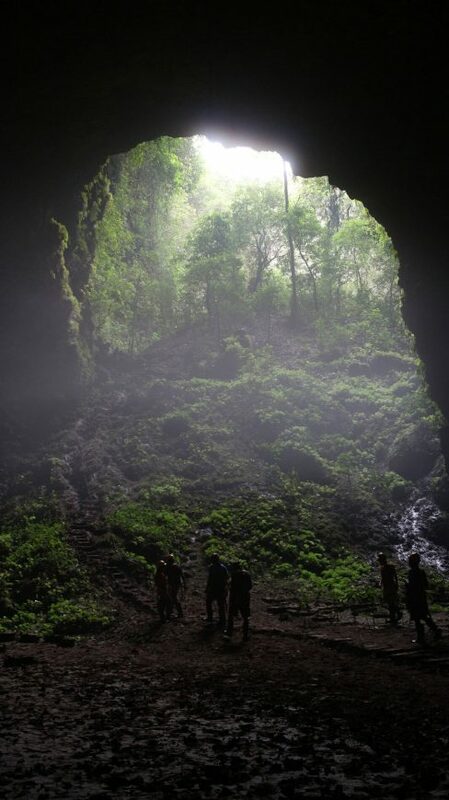 Goa Jomblang is a vertical cave that you drop into. Well, you’ll be lowered into the cave, by a tour guide, along with another cave diver. The views both above the cave and below are jaw-dropping. When you stand inside this cave with your mud galoshes and your headlamp on, you’ll definitely be channeling a bit of Indiana Jones for a second. The drive out to the cave takes a couple of hours, and you’ll be doing a lot of waiting as other tourists are lowered into the cave after you. 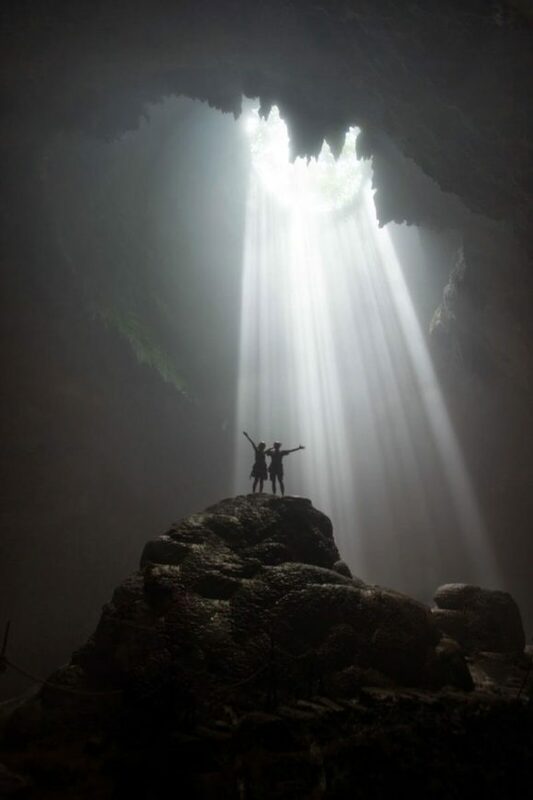 But whether or not you’re into caving, this is one of the most beautiful experiences you can possibly add to your Yogyakarta itinerary. By now you’ve got to know that I’m obsessed with jumping in the water if I can. And at this beach, you can! This is one of the most relaxing things to do in Yogyakarta. After the sore disappointment at the Water Palace, this beach is where it’s at. It’s a quiet little greenish blue cove with water so calm it barely laps against the shore. A swimmer’s paradise. Indonesian food is SO GOOD! Yes, you can actually have a guide pick you up and take you around town to try the traditional regional food. You also get to sample local drinks, and mix it up with the local people in ways you otherwise wouldn’t if you were going it alone. A Yogyakarta tour guide will pick you up in the early morning and take you out all day to climb a waterfall, tube down a river, and explore a cave. Along the way, you’ll be regaled with legends and myths, stories about ghosts and history lessons from the area. This one is for the adventurous outdoorsy Yogyakarta itineraries. Get picked up from your hotel or hostel and driven to a Unesco World Heritage site. Then, you ‘ll sit and watch a classic Indonesian ballet unfold before your eyes. Their traditional dancing is incredible! The dramatic ballet reenacts the story of Prince Rama, so you get a bit of a history lesson and an optional buffet dinner to go with it! Can’t get enough rivers and waterfalls? Well here’s more to add to your Yogyakarta itinerary. A Yogyakarta tour guide will pick you up for a full day of river rafting yet another river, that not only leads you along five different waterfalls but also takes you to a World Unesco temple compound. 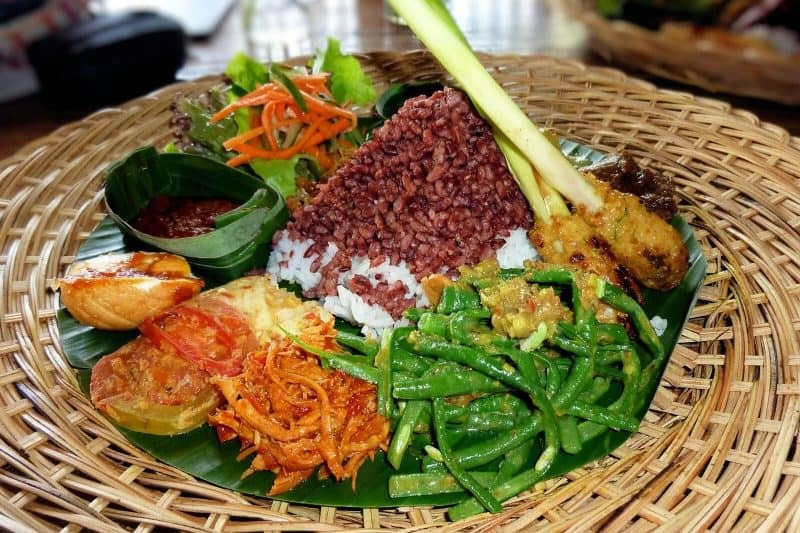 And you get a traditional Javanese lunch out of the deal. Don’t forget, if you’re still up for more adventure, some of the most popular adventure activities are accessible from Jogjakarta. If you’re looking to climb volcanos and get a peek at sunrise, I can’t recommend visiting Mount Bromo enough! Not enough? Need a bit more adrenaline? You could climb into a crater at 3 am to watch blue flame jut from the earth’s crust at Kawah Ijen. 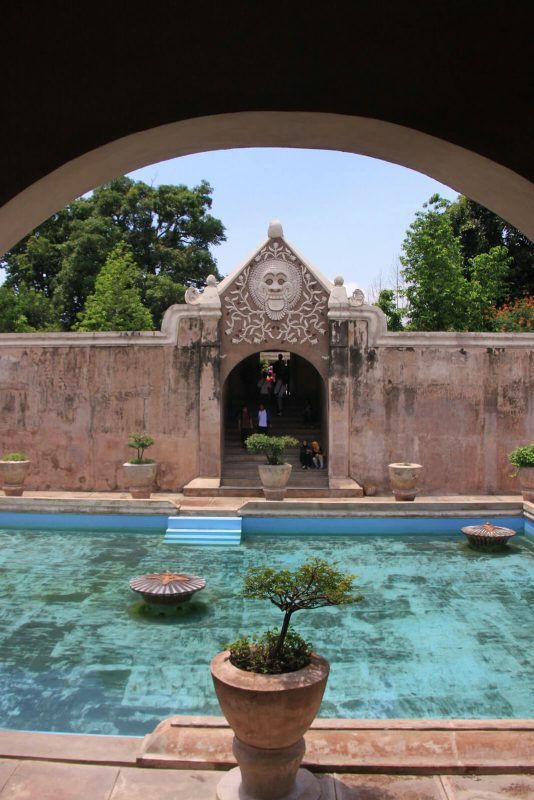 So which of the things to do in Jogjakarta are you most excited about? Click the pic and pin it for later!